Pikmin was one of the first 10 games released on the Game Cube, and Nintendo did a great job with this one. You play the role of Captain Olimar, whose ship (called the Dolphin) collided with an asteroid and scattered 30 parts to his ship on a planet. Once he lands, he finds a strange, red, very helpful creature and decides to call it Pikmin. Later, he finds that he can create more Pikmin by having the Pikmin kill other creatures and bring them back to the base, called Onion. 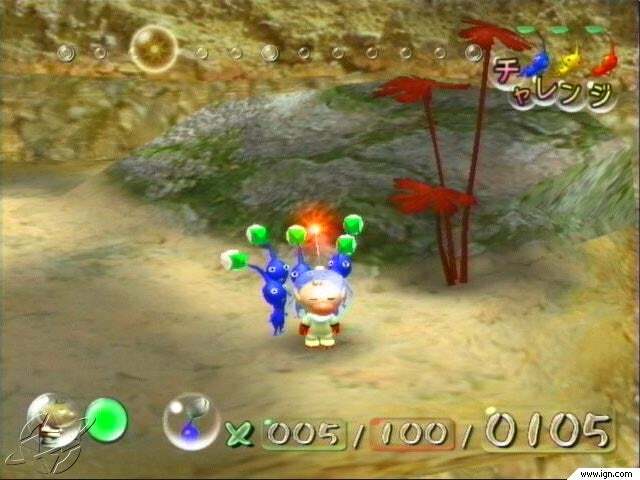 As you progress through the game, you will find yellow and blue Pikmin, each with their special abilities. Yellow ones can throw bombs at stone wall to knock it down, which the red or blue ones can?t do. The blue Pikmin can go in water, as the red and yellow Pikmin can\'t. You can command your Pikmin to kill enemies and take them back to the onion to make more Pikmin, tell them to knock down walls, push boxes, pick things up, and much more. Also, you can have them find nectar for themselves to make them run faster, which is a big help. The whole catch to this thing is that you can only play one day at a time. One day in the game is about 15 minutes, and if you don\'t gather all of your Pikmin by the end of the day, they get eaten by the enemies. The visuals in this game are some of the best I have seen on the GameCube. The effects of the water and the plants and flowers swaying in the breeze are very, very realistic. There is also a ?blur? effect when you move the camera quickly, which is really cool too. There are three zoom settings for the camera. I like to use the second one, which isn?t too close and not too far. If you use the closest camera setting, the textures (i.e. images on rocks, ground, etc.) get too blurry. The Dolphin is visually cool too, ranging from the burst of fire and smoke to the parts of the ship. However, at the end of every day, the edges on it look like they could be smoothed out a little more, which would be fixed with HDTV capability that the game has. Progressive Scan means that you get higher resolution, HDTV quality graphics. To use this, you do need to buy a special HDTV Cable directly from Nintendo which you connect to your HDTV box. The sound and music are also some of the finest on the ?Cube. The sounds are very detailed, from the rustling plants, to the sounds of the little Pikmin. Everything has its own type of sound, so after a while you could play the game with your eyes closed and still recognize what\'s going on. The game also supports Dolby Surround. The music is also very detailed. Each level, menu or movie has its own song, and when there is an enemy nearby there is a little suspense seamlessly added to the current music. Controlling the game is as easy as pie: A uproots/throws Pikmin, B calls your Pikmin and X dismisses and sorts out your Pikmin. Nearly every button is used on the controller. Being the strategy game that it is, there is no lagging with it, so that is also great. From a Christian standpoint, this game is squeaky clean.